Eric Young flies out to left fielder Khris Davis. November 13, 2018 RHP Alfredo Figaro assigned to Navegantes del Magallanes. November 7, 2016 RHP Alfredo Figaro elected free agency. October 20, 2016 RHP Alfredo Figaro assigned to Tigres del Licey. August 22, 2016 RHP Alfredo Figaro assigned to Oklahoma City Dodgers from Tulsa Drillers. July 27, 2016 Tulsa Drillers activated RHP Alfredo Figaro from the 7-day disabled list. July 19, 2016 sent RHP Alfredo Figaro on a rehab assignment to AZL Dodgers. June 19, 2016 RHP Alfredo Figaro assigned to Tulsa Drillers. June 10, 2016 Los Angeles Dodgers signed free agent RHP Alfredo Figaro to a minor league contract. November 3, 2014 RHP Alfredo Figaro elected free agency. 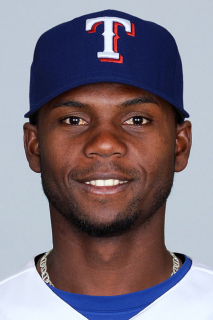 October 31, 2014 Texas Rangers sent RHP Alfredo Figaro outright to Round Rock Express. 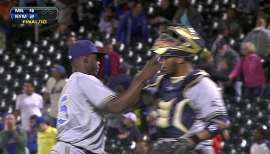 October 2, 2014 Texas Rangers claimed RHP Alfredo Figaro off waivers from Milwaukee Brewers. August 30, 2014 Milwaukee Brewers recalled RHP Alfredo Figaro from Nashville Sounds. June 29, 2014 Milwaukee Brewers optioned RHP Alfredo Figaro to Nashville Sounds. June 25, 2014 Milwaukee Brewers recalled Alfredo Figaro from Nashville Sounds. June 7, 2014 Nashville Sounds activated RHP Alfredo Figaro from the 7-day disabled list. May 19, 2014 Nashville Sounds placed RHP Alfredo Figaro on the 7-day disabled list retroactive to May 18, 2014. April 24, 2014 Milwaukee Brewers optioned RHP Alfredo Figaro to Nashville Sounds. April 21, 2014 Milwaukee Brewers recalled Alfredo Figaro from Nashville Sounds. March 22, 2014 Milwaukee Brewers optioned RHP Alfredo Figaro to Nashville Sounds. August 30, 2013 Milwaukee Brewers recalled Alfredo Figaro from Nashville Sounds. August 16, 2013 Milwaukee Brewers optioned Alfredo Figaro to Nashville Sounds. July 24, 2013 Alfredo Figaro roster status changed by Milwaukee Brewers. July 22, 2013 Milwaukee Brewers sent RHP Alfredo Figaro on a rehab assignment to AZL Brewers. June 26, 2013 Milwaukee Brewers placed RHP Alfredo Figaro on the 15-day disabled list retroactive to June 24, 2013. Right oblique strain. March 30, 2013 Milwaukee Brewers selected the contract of RHP Alfredo Figaro from Nashville Sounds. March 29, 2013 Alfredo Figaro assigned to Nashville Sounds. February 1, 2013 RHP Alfredo Figaro assigned to Dominican Republic. January 31, 2013 Milwaukee Brewers signed free agent RHP Alfredo Figaro to a minor league contract and invited him to spring training. December 26, 2012 RHP Alfredo Figaro transferred to Toros del Este from Tigres del Licey. December 19, 2012 Milwaukee Brewers signed free agent Alfredo Figaro. December 14, 2010 Detroit Tigers released RHP Alfredo Figaro. November 3, 2010 Alfredo Figaro assigned to Tigres del Licey. September 23, 2010 Alfredo Figaro assigned to Estrellas de Oriente. August 20, 2010 Detroit Tigers recalled Alfredo Figaro from Toledo Mud Hens. May 14, 2010 Detroit Tigers optioned Alfredo Figaro to Toledo Mud Hens. May 12, 2010 Detroit Tigers recalled Alfredo Figaro from Toledo Mud Hens. March 20, 2010 Detroit Tigers optioned Alfredo Figaro to Toledo Mud Hens. October 16, 2009 RHP Alfredo Figaro assigned to Estrellas de Oriente. September 16, 2009 Alfredo Figaro roster status changed by Detroit Tigers. August 24, 2009 sent RHP Alfredo Figaro on a rehab assignment to Erie SeaWolves. July 3, 2009 Alfredo Figaro roster status changed by Toledo Mud Hens. June 29, 2009 Detroit Tigers optioned Alfredo Figaro to Toledo Mud Hens. June 20, 2009 Detroit Tigers recalled Alfredo Figaro from Erie SeaWolves. June 20, 2009 Alfredo Figaro roster status changed by Detroit Tigers.